The Algarve has everything to offer as a holiday destination. With buzzing nightlife, beautiful beaches, historic buildings and unique cuisine, the Algarve is the perfect destination for families, couples and solo-travellers. In this article we will look at some of the best things to experience for your trip to the Algarve. The Algarve is in the south-western corner of mainland Europe, and has the coastline of the Atlantic Ocean. As a European city that is only a stones-throw from North Africa, many groups have occupied it over its long history, including the Phoenicians, the Romans, and the Moors from North Africa. Amazing examples of Roman and Islamic architecture can still be seen throughout this historical region. 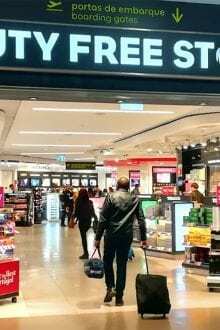 Faro is a common place to begin and end a holiday in the Algarve, as it is home to southern Portugal’s international airport also known as the Algarve Airport. But just because it’s often an essential transport stopover, don’t think that there isn’t plenty to see in Faro. Faro is a historic city, with a relaxed atmosphere, golden beaches and a walled, old town that is full of churches, bars and restaurants. It is now the capital of the Algarve region, and the largest city in the Algarve. Spend the day relaxing in some of the green city parks and explore the old town. At night, enjoy the restaurants in the marina district that serve traditional Portuguese seafood dishes. Climb the clock tower of the Cathedral of Faro (“Sé cathedral“), which offers a panoramic view of the city and the nearby Ria Formosa National Park. 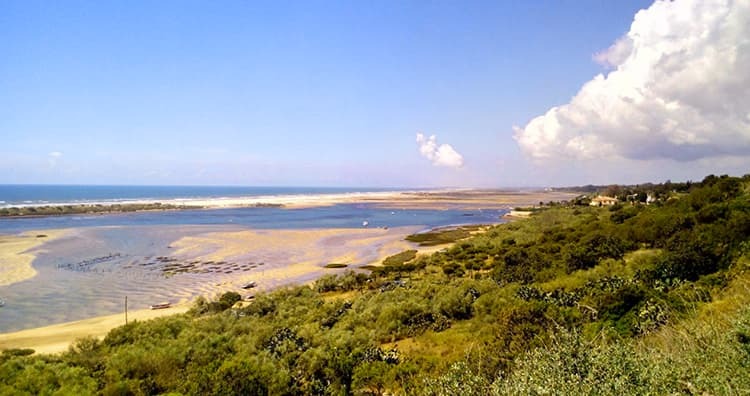 The Ria Formosa Natural Park was recently elected into the Seven Natural Wonders of Portugal. It’s a great place to spend the day on a boat exploring the winding waterways, which are home to more than 20,000 migratory birds during the winter season. Here’s a great idea. Why not pre-book a tour to Ria Formosa before you go? The team at Get Your Guide are the best you can get with friendly guides, organised tours and no hassles. They have a great deal at the moment on a catamaran tour of four islands within the Ria Formosa Natural Park. You can even go snorkelling there. Click here for all the details. Ria Formosa Natural Park, Portugal. If you fancy yourself as a keen surfer, or if you’re excited to learn, Praia de Faro beach is one of the best surfing locations in the Algarve. Only a bus trip from both the airport or from the town centre, it’s sure to provide you with a relaxing beach day, or a day surfing the waves. 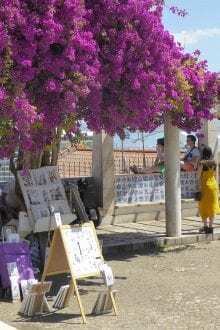 You might like to read Visit Faro next. Vilamoura is a destination popular amongst the young Portuguese crowd for its lively nightlife and great beaches, but it’s also a great town for families, with plenty of activities for the kids. Located in the middle of the southern coast of Portugal, it is easily accessible from Faro’s airport. It is one of the more expensive holiday destinations in the Algarve, offering numerous luxury resorts and all-inclusive tours. Tee off at one of Vilamoura’s many golfing resorts, such as Pine Cliffs Resort, which boasts nine spectacular holes alongside cliffs facing the Atlantic Ocean. 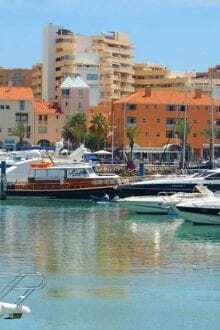 The marina in Vilamoura is particularly beautiful, and a variety of boats are available to hire by the hour or for the day. If you’re keen for a thrill, water sports such as parasailing and Jet Skis are available from the marina. If Vilamoura sounds like your ideal vacation location, have a look at Vilamoura Holidays. Famous for its stunning beaches, historical old town and incredible ocean-side rock formations, Lagos is a great holiday location for all tourists. Located 18 km (11 miles) from the west coast of Portugal, this historically significant town has been a centre for trade for centuries due to its natural harbour, which is still in use today. The old town of Lagos still exists within city walls that were built in the eighth century under the Moorish rule. Exploring the old town, you will find historical buildings and museums dedicated to the Age of Discoveries, which was a significant period of Portuguese world exploration in the 15th century. 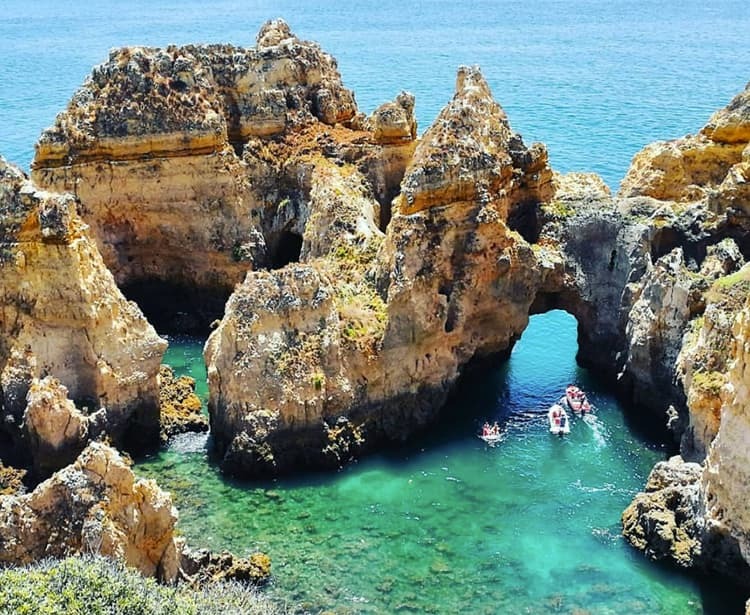 Ponta di Piedade is a natural adventure waiting only a few minutes from the old town of Lagos. Explore the turquoise waters and sandstone rock cliffs by walking, swimming or by boat. Small boats take tours from Lagos, along the coast of the Atlantic, and under rock arches into small natural caves. Ponta da Piedade, Algarve, Portugal. It’s a good idea to book a tour early if you want to explore these caves by boat. Have a look at this best-selling deal from Get Your Guide. The skipper knows all the secret caves and will tell you all about it on the cruise. Click here to book this really great trip. 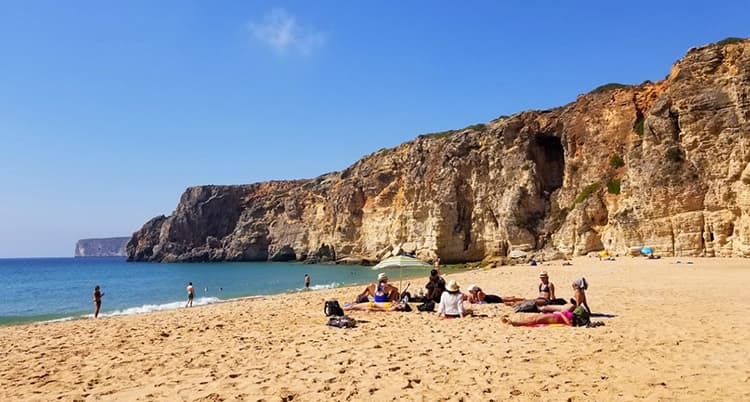 It’s only a short walk from Ponta di Piedade to find small beaches such as Praia do Camila, which is a great spot to spend the day and escape from the urban landscape of Lagos. The crystal clear waters here are perfect for a swim. There is more to Lagos. Want to know? 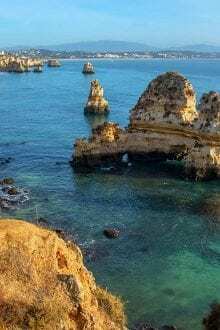 Read our article on Visiting Lagos in Portugal. Known for once being the capital of the Algarve under the Moorish rule and its magnificent castle, Silves is a small town about 10 km (6 miles) inland on the Arade River. 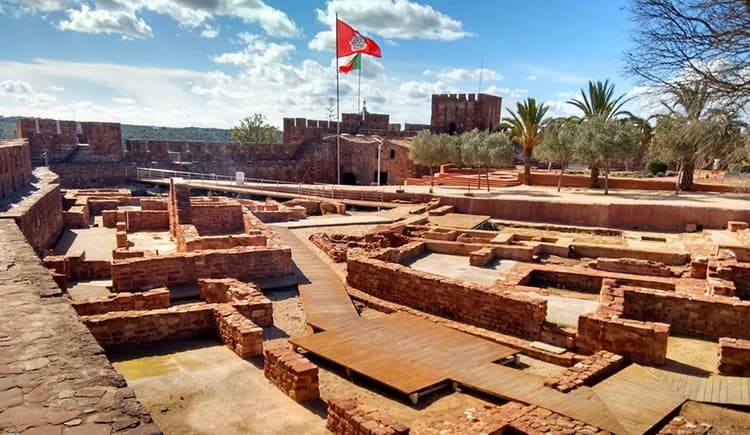 Explore the Silves Castle; a maze of Roman and Moorish architecture. Archaeological sites within the castle expose the complex, grandiose designs employed by the ancient rulers of the Algarve. The Archaeological Museum (“Museu Municipal de Arqueologia de Silves” (website is in Portuguese)) is an exhibition space located 20 metres (66 feet) underground, in a 12th century cistern. Climbing down the winding stairs, you will find displayed many relics from the past, depicting the ever-changing culture of the region. Want more about Silves? Have a look at: Your Ultimate Travel Guide to Silves. Located in the south-western corner of Portugal, it takes the most effort to travel to this remote Algarve town. However, it is often less crowded than the other Algarve towns, especially in the high season, making Sagres the perfect escape from the masses of tourists. Many beaches surround the town of Sagres, catering for all visitors. Calm, relaxing beaches can be easily accessed, as well as secluded surf beaches. Surfing lessons are relatively inexpensive, and the popular Praia do Beliche is the perfect location to start. Praia do Beliche, the Algarve, Portugal. Gaze over the Atlantic from the end of the world. Cabo de São Vicente is the most western point of southern Portugal, and in medieval times, was considered to be the end of the world. A magnificent lighthouse marks the perfect place to start a hike along the coastal cliffs of the natural park. For all the latest articles about the Algarve and more, be sure to subscribe to our newsletter so you don’t miss out. With so many amazing places to visit, two or three weeks could easily be spent on holiday in the Algarve. The international airport in Faro is easily accessible in a central location of the Algarve, and flies to many European destinations. This allows for a quick, sunny weekend getaway. If you’re coming from northern Europe, the Algarve is the perfect trip to catch some sun in the winter, as the mild winter months provide some sunny days amongst the rain and it can often be warm enough for a beach day. From June to September is the peak time in the Algarve, when a lot of local and international tourists will come to enjoy the summer holidays. Want to know about the weather in the Algarve? It’s pretty good all year-round, but for more details, read: Algarve Weather. Holidays to the Algarve can be booked online through booking websites, and accommodation is best booked in advance in the high season. You are sure to find a deal on Booking.com, Expedia and also the official sites of each hotel. If you’re coming from the UK, you could also find a great package deal on Jet 2 Holidays. Do you have any questions about your next Algarve holiday that we can help you with? Leave a message below. 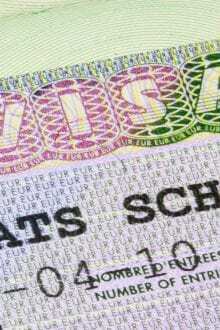 Born in Australia, I studied at Melbourne University, whilst travelling everywhere possible between semesters. I'm currently working as a tour guide in Lisbon, and enjoying learning the language and experiencing the Portuguese culture. I have a keen interest in history, music and people.